Van Nes Rotationplasty (VNRP) is a biological reconstructive surgical method for pediatric sarcoma, complex trauma or severe lower limb deficiencies that often gets overlooked due to cosmetic reasons and psychological aspects. We report a unique case of knee stiffness and severe scarring from burns treated with this technique in a young patient who had also amputated contralateral femur. A 15-year-old boy was trapped in a fire 10 years ago and sustained extensive contractures on his left knee due to severe burns and also an above knee amputation on his right thigh. For 10 years the boy had never received rehabilitation or worn any prosthesis and he managed to move bearing mainly on his palms. On admission to our hospital Van Nes rotationplasty was preferred among other treatment options as the most suitable solution for him and was successfully performed without complications. The patient had severe stiffness on his right hip and decreased muscle power in the VNRP leg but after intensive physiotherapy he was able to stand upright and walk again using custom made bilateral prostheses and crutches. VNPR is a reasonable option in severe contractures and scarring of the knee joint. Keywords: Van Nes Rotationplasty, Knee, Physiotherapy, Prostheses, Scar tissue, Amputation. © 2019 Tyllianakis et al. Van Nes Rotationplasty (VNPR) is a surgical procedure consisting of limb-saving shortening of the leg with a rotation of 180o of the lower leg which is adapted to the remaining femur, changing the ankle function into a new knee joint [1Wick JM, Alexander KM. Rotationplasty - a unique surgical procedure with a functional outcome. AORN J 2006; 84(2): 189-214. [http://dx.doi.org/10.1016/S0001-2092(06)60488-2] [PMID: 16927 586] ]. The functional outcome of such a technique is that the knee flexion corresponds to the former ankle dorsiflexion and the knee extension to the former ankle plantar flexion [2Sakkers R, van Wijk I. Amputation and rotationplasty in children with limb deficiencies: Current concepts. J Child Orthop 2016; 10(6): 619-26. [http://dx.doi.org/10.1007/s11832-016-0788-7] [PMID: 27826 906] ]. In order for this surgery to be performed the ankle should be in optimum condition prior to the procedure and the sciatic nerve should remain fully functional [3Hillmann A, Rosenbaum D, Schröter J, Gosheger G, Hoffmann C, Winkelmann W. Electromyographic and gait analysis of forty-three patients after rotationplasty. J Bone Joint Surg Am 2000; 82(2): 187-96. [http://dx.doi.org/10.2106/00004623-200002000-00004] [PMID: 1068 2727] ]. A prosthetic leg is worn for 6 weeks after the surgery to assist the patient with daily activities; the prosthesis contains a socket, a metal guided thigh shaft with a single – axis hinged joint at the upper ankle joint along with its lower part [4So NF, Andrews KL, Anderson K, et al. Prosthetic fitting after rotationplasty of the knee. Am J Phys Med Rehabil 2014; 93(4): 328-34. [http://dx.doi.org/10.1097/PHM.0000000000000044] [PMID: 2439 8578] ]. The extended position of the leg and the maximum flexion are controlled by the axis. This flexion ranges between 70° (in the beginning) and 90o, a limit which should not be surpassed to avoid a sprain or a fracture of the ankle. VNRP is a procedure that was originally used for several varieties of femur hypoplasia or absence [5Van Nes CP. Rotation-plasty for congenital defects of the femur: Making use of the ankle of the shortened limb to control the knee joint of the prosthesis. J Bone Joint Surg Br 1950; 32: 12-6. [http://dx.doi.org/10.1302/0301-620X.32B1.12] ], but had been also used in other forms lower limb deficiencies [2Sakkers R, van Wijk I. Amputation and rotationplasty in children with limb deficiencies: Current concepts. J Child Orthop 2016; 10(6): 619-26. [http://dx.doi.org/10.1007/s11832-016-0788-7] [PMID: 27826 906] ], trauma [6Klos K, Mückley T, Gras F, Hofmann GO, Schmidt R. Early posttraumatic rotationplasty after severe degloving and soft tissue avulsion injury: A case report. J Orthop Trauma 2010; 24(2): e1-5. [http://dx.doi.org/10.1097/BOT.0b013e3181b1df3c] [PMID: 2010 1125] ], tumors [3Hillmann A, Rosenbaum D, Schröter J, Gosheger G, Hoffmann C, Winkelmann W. Electromyographic and gait analysis of forty-three patients after rotationplasty. J Bone Joint Surg Am 2000; 82(2): 187-96. [http://dx.doi.org/10.2106/00004623-200002000-00004] [PMID: 1068 2727] , 4So NF, Andrews KL, Anderson K, et al. Prosthetic fitting after rotationplasty of the knee. Am J Phys Med Rehabil 2014; 93(4): 328-34. [http://dx.doi.org/10.1097/PHM.0000000000000044] [PMID: 2439 8578] , 7Forni C, Gaudenzi N, Zoli M, et al. Living with rotationplasty--quality of life in rotationplasty patients from childhood to adulthood. J Surg Oncol 2012; 105(4): 331-6. [http://dx.doi.org/10.1002/jso.22088] [PMID: 22311817] , 8Rödl RW, Pohlmann U, Gosheger G, Lindner NJ, Winkelmann W. Rotationplasty - quality of life after 10 years in 22 patients. Acta Orthop Scand 2002; 73(1): 85-8. [http://dx.doi.org/10.1080/000164702317281468] [PMID: 119 28918] ], infected knee arthroplasty [9Dumont CE, Schuster AJ, Freslier-Bossa M. Borggreve-Van Nes rotationplasty for infected knee arthroplasty - A case report. Acta Orthop 2010; 81(2): 268-70. [http://dx.doi.org/10.3109/17453671003667168] [PMID: 2017 0417] ] and in one report was used in an extended burn around the knee [10Khatri B, Richard B. Use of Van Nes rotationplasty to manage a burnt knee. Burns 2000; 26(1): 88-91. [http://dx.doi.org/10.1016/S0305-4179(99)00098-4] [PMID: 10630 324] ]. When rotationplasty is applied, both the family and the patient should have the appropriate amount of information regarding the postoperative aesthetic outcome which can cause considerable psychological issues [2Sakkers R, van Wijk I. Amputation and rotationplasty in children with limb deficiencies: Current concepts. J Child Orthop 2016; 10(6): 619-26. [http://dx.doi.org/10.1007/s11832-016-0788-7] [PMID: 27826 906] , 7Forni C, Gaudenzi N, Zoli M, et al. Living with rotationplasty--quality of life in rotationplasty patients from childhood to adulthood. J Surg Oncol 2012; 105(4): 331-6. 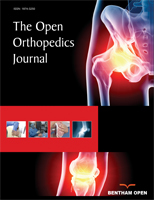 [http://dx.doi.org/10.1002/jso.22088] [PMID: 22311817] , 8Rödl RW, Pohlmann U, Gosheger G, Lindner NJ, Winkelmann W. Rotationplasty - quality of life after 10 years in 22 patients. Acta Orthop Scand 2002; 73(1): 85-8. [http://dx.doi.org/10.1080/000164702317281468] [PMID: 119 28918] , 11Benedetti MG, Okita Y, Recubini E, Mariani E, Leardini A, Manfrini M. How much clinical and functional impairment do children treated with knee rotationplasty experience in adulthood? Clin Orthop Relat Res 2016; 474(4): 995-1004. [http://dx.doi.org/10.1007/s11999-016-4691-9] [PMID: 26754 115] ] and it seems to be the only factor for which a rotationplasty is not usually selected as a treatment plan despite o its excellent results [12Rota V, Benedetti MG, Okita Y, Manfrini M, Tesio L. Knee rotationplasty: Motion of the body centre of mass during walking. Int J Rehabil Res 2016; 39(4): 346-53. [http://dx.doi.org/10.1097/MRR.0000000000000195] [PMID: 2768 5013] , 13Fuchs B, Sim FH. Rotationplasty about the knee: Surgical technique and anatomical considerations. Clin Anat 2004; 17(4): 345-53. [http://dx.doi.org/10.1002/ca.10211] [PMID: 15108342] ]. Based on gait and electromyographic data, rotationplasty has proven to offer optimum, long-lasting gait rehabilitation [3Hillmann A, Rosenbaum D, Schröter J, Gosheger G, Hoffmann C, Winkelmann W. Electromyographic and gait analysis of forty-three patients after rotationplasty. J Bone Joint Surg Am 2000; 82(2): 187-96. [http://dx.doi.org/10.2106/00004623-200002000-00004] [PMID: 1068 2727] ]. The only deviations noticed concerning stride length, cadence, stride duration, stance – swing ratio and velocity were rather insignificant when compared to healthy people [12Rota V, Benedetti MG, Okita Y, Manfrini M, Tesio L. Knee rotationplasty: Motion of the body centre of mass during walking. Int J Rehabil Res 2016; 39(4): 346-53. [http://dx.doi.org/10.1097/MRR.0000000000000195] [PMID: 2768 5013] -15Ginsberg JP, Rai SN, Carlson CA, et al. A comparative analysis of functional outcomes in adolescents and young adults with lower-extremity bone sarcoma. Pediatr Blood Cancer 2007; 49(7): 964-9. [http://dx.doi.org/10.1002/pbc.21018] [PMID: 16921515] ]. (a). Illustrative image of the patient’s legs showing the amputated right leg and the burnt left leg with the severe contracture, (b). X-ray of the right femur showing the short stump and (c). Lateral view of the contracted left knee; the patient was unable to extend it. (a & b) Postoperative and post-computed tomography angiography of the right leg, showing good axis and stability of the osteotomy side. (c) clinical appearance of the new “knee” after 2 months. We report a unique case of VNRP applied to a 15-year-old boy due to severe burn contractures of his left knee; having also his right leg amputated, he was unable to walk for more than 10 years but he finally managed to walk using bilateral custom-made prostheses and crutches. A 15-year-old boy from Tanzania was amputated on his right thigh (18 cm length from the hip joint) in his country 10 years ago after a severe burn injury that also left him with full contracture and extensive scar tissue deformities on the left knee. Scar skin extended from his left distal third of the thigh to the second third of his tibia (Fig. 1 ). For 10 years, the boy had never received rehabilitation or worn any prosthesis. He managed to move bearing mainly on his palms. He was brought to our department by a non-profit organization (Tanzania Orphans Mission) seeking a solution that would allow him to walk again. Several options were considered: above knee amputation, progressive extension of the knee with the Ilizarov apparatus, endoprosthesis, intercalary strut graft and Van Nes Rotationplasty, which was finally chosen for reasons presented in the discussion section. The goal was to provide him with a functional ‘knee’ for later use of a prosthesis, similar to that used in below-knee amputees. The patient and his supporting friends gave their consent after they were fully informed about the pros and cons of this method, given special emphasis on the psychological effects. Radiological depiction of the vascular network of the limb that was obtained preoperatively showed no considerable obstruction of the femoral artery and its branches. The operation lasted 3.5 hours. The neurovascular bundle was successfully released from the ample surrounding scar tissue and proximal tibia and distal femur were excised as much as enough for the remaining muscles to cover the bones. The required rotation (180 degrees) was easily achieved. We did not concern about the level of the new “knee” because the other knee did not exist either. The rest surgery was performed according to the original technique described by Van Nes. Split thickness skin graft was used to cover a defect in the middle of the surgical trauma. We needed to revise the trauma on the 6th postoperative day because the patient’s vital signs indicated consistent hemorrhage and the trauma site was progressively enlarged. A hole was found at the proximal part of the tibial artery that was successfully repaired. At the same time, additional split thickness skin graft was applied. The postoperative period was otherwise uncomplicated. The patient remained in the hospital for 1 month, where he started a daily rehabilitation program. Before his discharge, radiological examination showed early signs of callus formation and the patient was clear to wearing a prosthesis (Fig. 2 ). After he left the hospital, we took measurements from the right limb for the fabrication of a prosthesis and an intense rehabilitation program was initiated. The specific problems that we had to deal with were the following: a) the right hip had a stiff contracture of 10° and muscle strength was reduced (MRC=3) which was not enough for the patient in order to use a prosthesis efficiently, b) the patient had not been in an upright position for 10 years, thus he had to relearn walking, c) the timeframe of rehabilitation had to be limited to 85 days because the patient had to get back to his country and also the fact that d) a double amputated patient demands much more effort and rehabilitation time. The physiotherapy treatment plan for the right (amputated) limb included complete strengthening in all levels, regaining full ROM in all movements and also efforts to release the contracture. For the left (VNRP) leg the goals were to regain muscle contraction after rotationplasty, 0° - 60° flexion extension ROM of the “new knee” and strengthening of the muscles that affect the flexion-extension movement of the “new knee” after regaining muscle contraction. In addition, we scheduled pulmonary physiotherapy, strengthening exercises of the upper limbs (to have the strength to use walking aids), and also of the abdominal and lumbar muscles. The details of the custom-made prostheses are described in Table 1. Non-dynamic knee and feet design was preferred because the patient’s condition required some movement restriction that provided better stability and control. However, the use of dynamic knee and feet mode is not excluded in the future, when the patient will be familiar with the use of his prostheses. Αn adapter with rotation was applied because in the beginning, the patient showed an inward rotation of the right stump, something that is expected to change in the future and consequently new alignment of the prosthesis can be made. For the right stump, we started muscle strengthening on all muscle groups; initially the patient showed a score of 4 – in MRC scale on all movements of the thigh (flexion, extension, adduction, abduction) but with strengthening exercises and stretching we managed to increase the muscle strength to 5 in MRC scale in all movements and released the hip contracture in 15 days. At this point the prosthesis of the right limb was ready, and we started to train the patient on walking with one leg on a walkway with sidebars on both sides (Fig. 3A ). After 10 days of training with the prosthesis, the patient could use it easily. For the left thigh, we started muscle strengthening on all muscle groups which scored 3 in MRC scale in all movements of the thigh (flexion, extension, adduction, abduction). We also chose to use Low-frequency Pulsed Electromagnetic Fields (PEMF) (duration 40 mins / 4 times per week) at the compound point (femur with tibia) to reduce postoperative edema; this had probably a positive effect on bone healing as has been reported in recent studies [16Ross CL, Siriwardane M, Almeida-Porada G, et al. The effect of low-frequency electromagnetic field on human bone marrow stem/progenitor cell differentiation. Stem Cell Res (Amst) 2015; 15(1): 96-108. [http://dx.doi.org/10.1016/j.scr.2015.04.009] [PMID: 26042 793] , 17Putowski M, Piróg M, Podgórniak M, et al. The use of electromagnetic radiation in the physiotherapy. European Journal of Medical Technologies 2016; 2: 53-8.]. We excluded electrotherapy due to the hypersensitivity that the patient had around that area. We also used Visual Analog Scale (VAS) to assess pain taking care not to exceed a score of 6 during the whole rehabilitation process. At 20 days we got active ROM on all four levels and muscle strength score of 4- in MRC scale. As for the ankle joint that had to function as a knee, passive ROM 0° - 65° but no active ROM was recorded from the first day of the rehabilitation. Strengthening exercises and stretching was initiated. At 18 days passive ROM was 0° - 90°. On the 22nd day the patient appeared to have a muscle strength score of 1 in MRC scale for the first time, gradually increased to 3 and 4- on the 32nd day and 45th day respectively. On the 58th day the muscle strength score was 4 in MRC scale and active ROM was 0° - 70°; at that time the second prosthesis for the left leg was applied and it was the first time after 10 years that the patient stood upright. Consequently, the patient began training on walking, with the prostheses applied on both legs, on a walkway with sidebars on both sides (Fig. 3B ). Immediately after that, we added balance and stamina exercises. On the 65th day, the patient was able to use the two prostheses safely inside the walkway with sidebars and started walking with crutches (Fig. 3C ). On the 75th day the patient could move and serve himself independently with the use of crutches and finally, on the 85th day, the day before his departure, the patient had muscle strength score 5 in MRC scale in flexion, extension, adduction and abduction in the right leg. At the left thigh he had full active ROM and muscle strength score 4+ in MRC scale in flexion, extension, adduction and abduction, and active ROM of 0° - 75° in flexion and extension of his “new knee” with muscle strength score 4+ in MRC scale in these two movements. On the 86th day the patient left for his country, happy and without hesitations about the aesthetic part of the rotationplasty (Fig. 3D ). Details and design of both prostheses. (A). Walking inside the walkway with the side bars with only the right prosthesis. (B). Walking inside the walkway with the side bars with both prostheses. (C). The boy takes his first steps with the aid of crutches. (D). Wearing both his prostheses one day before living for his country. The patient we present had a right thigh amputation and a non-functional left limb with severe knee deformity. The challenge we faced was to provide the patient with a functional left limb considering that his right limb would take a long prosthesis and then he would live in a rural area in Africa. We considered the following options: a) Above knee amputation of the left limb too. That was excluded because that would leave the patient with 2 short stumps, which would not make any substantial difference to the patient’s life. b) Application of an Ilizarov apparatus with hinges at the knee and gradual extension of the knee. That was also rejected because that would require that the patient would stay in the hospital area for a long time, well longer than his visa allowed. Potential occlusion of the vessels by gradual elongation was also considered. 3) Endoprosthesis; in case of a late complication after such operation it would be uncertain whether the patient could receive the appropriate treatment in his hometown. 4) Intercalary grafting. The main problem of that solution would be the elimination of any movement at the “knee” area. 5) Van Nes Rotationplasty which was finally chosen. Rotationplasty is a durable and biologic reconstructive option for lower extremity sarcomas in skeletally immature patients [3Hillmann A, Rosenbaum D, Schröter J, Gosheger G, Hoffmann C, Winkelmann W. Electromyographic and gait analysis of forty-three patients after rotationplasty. J Bone Joint Surg Am 2000; 82(2): 187-96. [http://dx.doi.org/10.2106/00004623-200002000-00004] [PMID: 1068 2727] , 4So NF, Andrews KL, Anderson K, et al. Prosthetic fitting after rotationplasty of the knee. Am J Phys Med Rehabil 2014; 93(4): 328-34. [http://dx.doi.org/10.1097/PHM.0000000000000044] [PMID: 2439 8578] , 7Forni C, Gaudenzi N, Zoli M, et al. Living with rotationplasty--quality of life in rotationplasty patients from childhood to adulthood. J Surg Oncol 2012; 105(4): 331-6. [http://dx.doi.org/10.1002/jso.22088] [PMID: 22311817] , 8Rödl RW, Pohlmann U, Gosheger G, Lindner NJ, Winkelmann W. Rotationplasty - quality of life after 10 years in 22 patients. Acta Orthop Scand 2002; 73(1): 85-8. [http://dx.doi.org/10.1080/000164702317281468] [PMID: 119 28918] ], but it can also be used in extreme lower limb deficiencies and trauma [2Sakkers R, van Wijk I. Amputation and rotationplasty in children with limb deficiencies: Current concepts. J Child Orthop 2016; 10(6): 619-26. [http://dx.doi.org/10.1007/s11832-016-0788-7] [PMID: 27826 906] , 6Klos K, Mückley T, Gras F, Hofmann GO, Schmidt R. Early posttraumatic rotationplasty after severe degloving and soft tissue avulsion injury: A case report. J Orthop Trauma 2010; 24(2): e1-5. [http://dx.doi.org/10.1097/BOT.0b013e3181b1df3c] [PMID: 2010 1125] ], infections [9Dumont CE, Schuster AJ, Freslier-Bossa M. Borggreve-Van Nes rotationplasty for infected knee arthroplasty - A case report. Acta Orthop 2010; 81(2): 268-70. [http://dx.doi.org/10.3109/17453671003667168] [PMID: 2017 0417] ] and severe soft tissues contractures [10Khatri B, Richard B. Use of Van Nes rotationplasty to manage a burnt knee. Burns 2000; 26(1): 88-91. [http://dx.doi.org/10.1016/S0305-4179(99)00098-4] [PMID: 10630 324] ], as in our case. The main advantage of rotationplasty is that it provides a high level of functionality in daily and sporting activities with the use of a more cosmetic transtibial prosthesis [2Sakkers R, van Wijk I. Amputation and rotationplasty in children with limb deficiencies: Current concepts. J Child Orthop 2016; 10(6): 619-26. [http://dx.doi.org/10.1007/s11832-016-0788-7] [PMID: 27826 906] , 11Benedetti MG, Okita Y, Recubini E, Mariani E, Leardini A, Manfrini M. How much clinical and functional impairment do children treated with knee rotationplasty experience in adulthood? Clin Orthop Relat Res 2016; 474(4): 995-1004. [http://dx.doi.org/10.1007/s11999-016-4691-9] [PMID: 26754 115] , 12Rota V, Benedetti MG, Okita Y, Manfrini M, Tesio L. Knee rotationplasty: Motion of the body centre of mass during walking. Int J Rehabil Res 2016; 39(4): 346-53. [http://dx.doi.org/10.1097/MRR.0000000000000195] [PMID: 2768 5013] ]. Patients can be sitting comfortably, showing a more natural posture as the former knee muscles exhibit a high level of adjustment in their new ‘pseudo-knee joint’ that becomes fully manageable by the patient while walking, sitting or doing sports [1Wick JM, Alexander KM. Rotationplasty - a unique surgical procedure with a functional outcome. AORN J 2006; 84(2): 189-214. [http://dx.doi.org/10.1016/S0001-2092(06)60488-2] [PMID: 16927 586] , 4So NF, Andrews KL, Anderson K, et al. Prosthetic fitting after rotationplasty of the knee. Am J Phys Med Rehabil 2014; 93(4): 328-34. [http://dx.doi.org/10.1097/PHM.0000000000000044] [PMID: 2439 8578] , 6Klos K, Mückley T, Gras F, Hofmann GO, Schmidt R. Early posttraumatic rotationplasty after severe degloving and soft tissue avulsion injury: A case report. J Orthop Trauma 2010; 24(2): e1-5. [http://dx.doi.org/10.1097/BOT.0b013e3181b1df3c] [PMID: 2010 1125] , 8Rödl RW, Pohlmann U, Gosheger G, Lindner NJ, Winkelmann W. Rotationplasty - quality of life after 10 years in 22 patients. Acta Orthop Scand 2002; 73(1): 85-8. [http://dx.doi.org/10.1080/000164702317281468] [PMID: 119 28918] , 11Benedetti MG, Okita Y, Recubini E, Mariani E, Leardini A, Manfrini M. How much clinical and functional impairment do children treated with knee rotationplasty experience in adulthood? Clin Orthop Relat Res 2016; 474(4): 995-1004. [http://dx.doi.org/10.1007/s11999-016-4691-9] [PMID: 26754 115] , 12Rota V, Benedetti MG, Okita Y, Manfrini M, Tesio L. Knee rotationplasty: Motion of the body centre of mass during walking. Int J Rehabil Res 2016; 39(4): 346-53. [http://dx.doi.org/10.1097/MRR.0000000000000195] [PMID: 2768 5013] ]. Patients have a higher level of dexterity and steadiness in their moves [1Wick JM, Alexander KM. Rotationplasty - a unique surgical procedure with a functional outcome. AORN J 2006; 84(2): 189-214. [http://dx.doi.org/10.1016/S0001-2092(06)60488-2] [PMID: 16927 586] , 12Rota V, Benedetti MG, Okita Y, Manfrini M, Tesio L. Knee rotationplasty: Motion of the body centre of mass during walking. Int J Rehabil Res 2016; 39(4): 346-53. [http://dx.doi.org/10.1097/MRR.0000000000000195] [PMID: 2768 5013] ], maintain pain sensation and temperature since the sciatic nerve is preserved [9Dumont CE, Schuster AJ, Freslier-Bossa M. Borggreve-Van Nes rotationplasty for infected knee arthroplasty - A case report. Acta Orthop 2010; 81(2): 268-70. [http://dx.doi.org/10.3109/17453671003667168] [PMID: 2017 0417] , 14Gebert C, Hardes J, Vieth V, Hillmann A, Winkelmann W, Gosheger G. The effect of rotationplasty on the ankle joint: Long-term results. Prosthet Orthot Int 2006; 30(3): 316-23. [http://dx.doi.org/10.1080/03093640600863802] [PMID: 171 62522] ] and also avoid serious postoperative side effects (phantom phenomenon limb-length discrepancy, endoprosthetic complications) [6Klos K, Mückley T, Gras F, Hofmann GO, Schmidt R. Early posttraumatic rotationplasty after severe degloving and soft tissue avulsion injury: A case report. J Orthop Trauma 2010; 24(2): e1-5. [http://dx.doi.org/10.1097/BOT.0b013e3181b1df3c] [PMID: 2010 1125] , 8Rödl RW, Pohlmann U, Gosheger G, Lindner NJ, Winkelmann W. Rotationplasty - quality of life after 10 years in 22 patients. Acta Orthop Scand 2002; 73(1): 85-8. [http://dx.doi.org/10.1080/000164702317281468] [PMID: 119 28918] -10Khatri B, Richard B. Use of Van Nes rotationplasty to manage a burnt knee. Burns 2000; 26(1): 88-91. [http://dx.doi.org/10.1016/S0305-4179(99)00098-4] [PMID: 10630 324] ]. The amputated limb fits deeper into the prosthetic socket and is capable of supporting a considerable amount of weight after osteotomy healing in comparison with any well-made transfemoral prosthesis [1Wick JM, Alexander KM. Rotationplasty - a unique surgical procedure with a functional outcome. AORN J 2006; 84(2): 189-214. [http://dx.doi.org/10.1016/S0001-2092(06)60488-2] [PMID: 16927 586] , 2Sakkers R, van Wijk I. Amputation and rotationplasty in children with limb deficiencies: Current concepts. J Child Orthop 2016; 10(6): 619-26. [http://dx.doi.org/10.1007/s11832-016-0788-7] [PMID: 27826 906] , 14Gebert C, Hardes J, Vieth V, Hillmann A, Winkelmann W, Gosheger G. The effect of rotationplasty on the ankle joint: Long-term results. Prosthet Orthot Int 2006; 30(3): 316-23. [http://dx.doi.org/10.1080/03093640600863802] [PMID: 171 62522] ]. Weight-bearing pain and morning stiffness are less in contrast to above-knee amputees [13Fuchs B, Sim FH. Rotationplasty about the knee: Surgical technique and anatomical considerations. Clin Anat 2004; 17(4): 345-53. [http://dx.doi.org/10.1002/ca.10211] [PMID: 15108342] , 14Gebert C, Hardes J, Vieth V, Hillmann A, Winkelmann W, Gosheger G. The effect of rotationplasty on the ankle joint: Long-term results. Prosthet Orthot Int 2006; 30(3): 316-23. [http://dx.doi.org/10.1080/03093640600863802] [PMID: 171 62522] ] presumably that a smaller amount of energy is required during walking [1Wick JM, Alexander KM. Rotationplasty - a unique surgical procedure with a functional outcome. AORN J 2006; 84(2): 189-214. [http://dx.doi.org/10.1016/S0001-2092(06)60488-2] [PMID: 16927 586] ]. The biggest controversy of rotationplasty is the cosmetic appearance without prosthesis, which makes this procedure not acceptable for every suitable candidate [3Hillmann A, Rosenbaum D, Schröter J, Gosheger G, Hoffmann C, Winkelmann W. Electromyographic and gait analysis of forty-three patients after rotationplasty. J Bone Joint Surg Am 2000; 82(2): 187-96. [http://dx.doi.org/10.2106/00004623-200002000-00004] [PMID: 1068 2727] , 6Klos K, Mückley T, Gras F, Hofmann GO, Schmidt R. Early posttraumatic rotationplasty after severe degloving and soft tissue avulsion injury: A case report. J Orthop Trauma 2010; 24(2): e1-5. [http://dx.doi.org/10.1097/BOT.0b013e3181b1df3c] [PMID: 2010 1125] , 15Ginsberg JP, Rai SN, Carlson CA, et al. A comparative analysis of functional outcomes in adolescents and young adults with lower-extremity bone sarcoma. Pediatr Blood Cancer 2007; 49(7): 964-9. [http://dx.doi.org/10.1002/pbc.21018] [PMID: 16921515] ]. In contrast, patients who had rotationplasty achieved psychological adaptation to the new reality in a finer way [6Klos K, Mückley T, Gras F, Hofmann GO, Schmidt R. Early posttraumatic rotationplasty after severe degloving and soft tissue avulsion injury: A case report. J Orthop Trauma 2010; 24(2): e1-5. [http://dx.doi.org/10.1097/BOT.0b013e3181b1df3c] [PMID: 2010 1125] , 13Fuchs B, Sim FH. Rotationplasty about the knee: Surgical technique and anatomical considerations. Clin Anat 2004; 17(4): 345-53. [http://dx.doi.org/10.1002/ca.10211] [PMID: 15108342] ] considering that soon after the surgery the functional outcome becomes obvious, thus increasing patient’s confidence in contrast with an above-knee amputation [11Benedetti MG, Okita Y, Recubini E, Mariani E, Leardini A, Manfrini M. How much clinical and functional impairment do children treated with knee rotationplasty experience in adulthood? Clin Orthop Relat Res 2016; 474(4): 995-1004. [http://dx.doi.org/10.1007/s11999-016-4691-9] [PMID: 26754 115] , 15Ginsberg JP, Rai SN, Carlson CA, et al. A comparative analysis of functional outcomes in adolescents and young adults with lower-extremity bone sarcoma. Pediatr Blood Cancer 2007; 49(7): 964-9. [http://dx.doi.org/10.1002/pbc.21018] [PMID: 16921515] ]. As a result, the patients’ social life and life satisfaction are not affected after the surgery [11Benedetti MG, Okita Y, Recubini E, Mariani E, Leardini A, Manfrini M. How much clinical and functional impairment do children treated with knee rotationplasty experience in adulthood? Clin Orthop Relat Res 2016; 474(4): 995-1004. [http://dx.doi.org/10.1007/s11999-016-4691-9] [PMID: 26754 115] , 13Fuchs B, Sim FH. Rotationplasty about the knee: Surgical technique and anatomical considerations. Clin Anat 2004; 17(4): 345-53. [http://dx.doi.org/10.1002/ca.10211] [PMID: 15108342] ]. In our case, we had to provide a reasonable rehabilitation program and custom-made prostheses in a non-ambulant patient with high thigh amputation on the right and rotationplasty on the left. The time frame was essentially limited and the patient had severe contractures and muscle deficiencies as he had not walked or stood upright for 10 years. His willingness and efforts under our guidance made him walk on his own using 2 crutches. With this case report, we present an extended indication of VNRP other than tumors and deformities. With good planning and meticulous technique in prosthesis manufacturing cases like that can be treated successfully even on limited time-frames. All authors contributed equally in the preparation of this manuscript. An informed consent was obtained from the patient and Tanzania Orphans Mission for publishing demographic, clinical and radiological images. We want to thank T.O.M. (Tanzania Orphans Mission) and the patient for their consent to publish this research and Mr. Hercules Fokas (Prosthetist – Orthotist) from Global Orthopedics Greece, for his meticulous rehabilitation program and information about the prostheses. Putowski M, Piróg M, Podgórniak M, et al. The use of electromagnetic radiation in the physiotherapy. European Journal of Medical Technologies 2016; 2: 53-8.